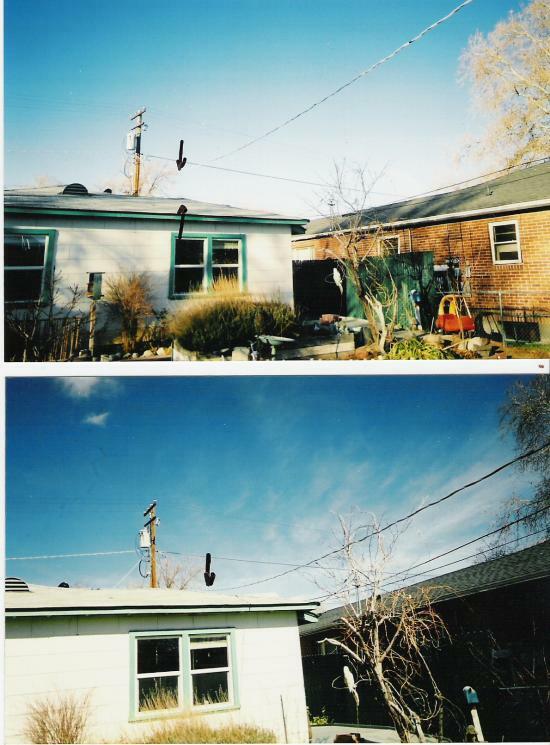 IS IT acsecptable for the power company service line to run over liveable dwelling?If it is how far off the roof does it need to be? That 3' is only "final conductor span" leading to the service head. Normally the clearance is 8' above the roof for a distance of 3' beyond the roof edge. Actually, the NESC is the Code that covers the serving electric utility’s service drop clearances. The 3 ft beyond the roof’s edge is not in the NESC. What is the NESC rule for height over a roof? It's up to the POCO. Here they won't allow the eight foot riser if it's more than 3 feet from the edge because they don't allow the line crews to use a ladder on the roof for safety reasons. So they specify five feet, no matter how much of the drop extends over the roof. These are "before and after" photos of one result of a service change I did. As you can see, the service drop has a lot more clearance than it previously had. So, yes, you can run these conductors over a dwelling, but you do need 36" clearance. While I believe that this is covered in NEC 230-24, your local utility is likely to have a different rule. Somehow the "before" and "after shots got reversed . I hate it when that happens! I will admit that 230 also references the pitch of the roof; this roof is right on the line, and I let the inspector decide. Part of this was based upon the heigth of the riser on the building getting new service; see photos added to "flagpoles" in "photos submitted for discussion."